What is of particular interest is that it looks similar to the destroyed base of Pilgrim’s Cross, on Holcombe Moor, Bury. That base was smashed to pieces by persons unknown in August 1901, as is recorded on the cube shaped monument that replaced it (which still stands today). For more on Pilgrim’s Cross click here. Pilgrim’s was a medieval wayside cross, which may mean that Holden’s Cross was from the same era. 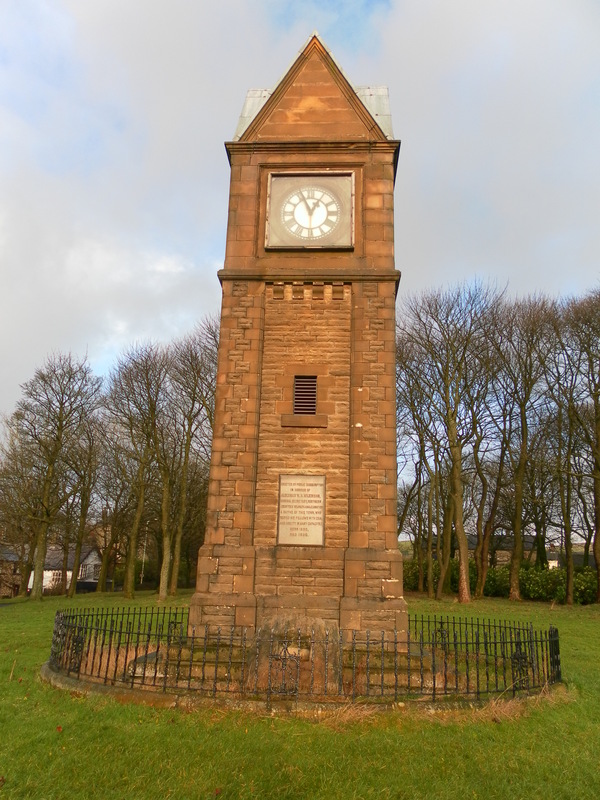 The cross base was moved to Victoria Park in 1914, but what of the original site of Holden’s Cross ? 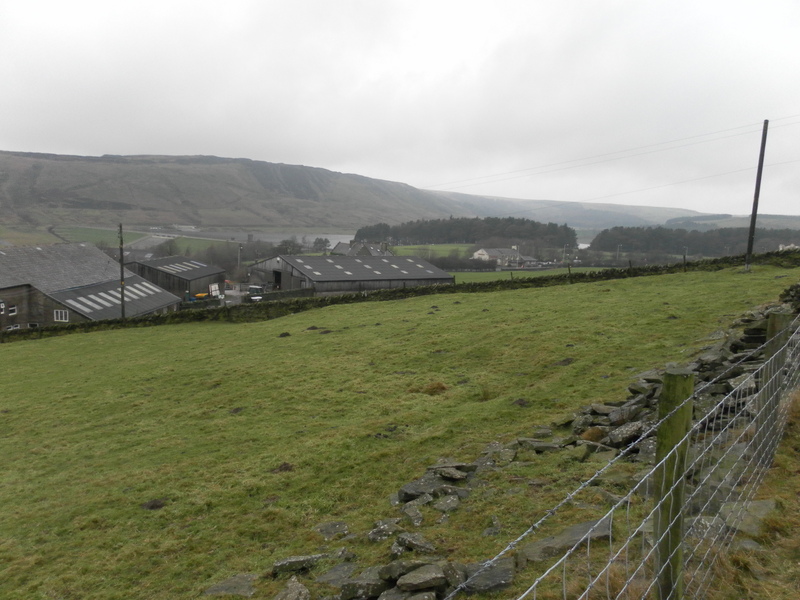 The name of Holden comes from the historically dominant family in this part of Haslingden. Henry de Lacy gave Adam de Holden the estate of land in 1272, after its previous owner was hung for “felony”. The Holden name is found all around the area, for example in Holden Wood, Holden Bank and Holden Vale. A branch of the family lived at Holden Hall and also at nearby Todd Hall. We know that the cross stood somewhere near Holden Hall. Haslingden Corporation bought the hall from its last owner, Maria Duckworth (born Maria Holden). They demolished the hall and turned the surrounding space into a cemetery . Holden Hall Cemetery was opened in 1902 and can still be visited today. Accounts differ to where exactly the cross was. 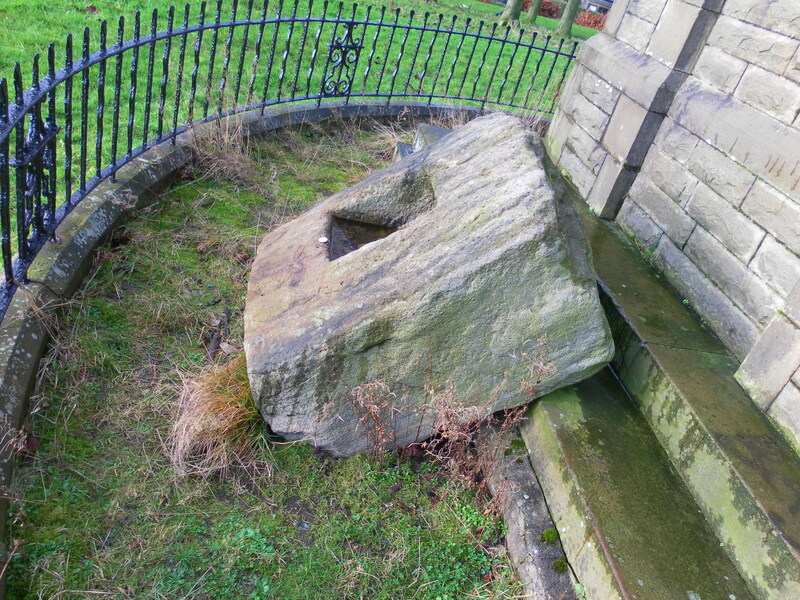 In The Ancient Crosses and Holy Wells of Lancashire, A.J. Noble states that “the cross base stood about 700 yards west of Holden Hall”, so presumably somewhere near the vicinity of the present day cemetery. Follow the public footpath north as it runs outside the west side of the cemetery. It passes Holden Hall Cottages, through a gate then past an old barn before beginning to bend round to the west. These buildings are all associated with the demolished Holden Hall that stood in the nearby corner of the cemetery. An old sunken track heads West. Follow it along the side of the valley (don’t take any paths heading up the hill). The track crosses over several stiles, past the back of Kettlewell Hall until you meet the road up to Clod Farm and Windy Harbour Farm. At this point, the choice of path is confusing: do not take the road up or down the hill. Keep on the path heading west, but do not go over the stile into the field heading towards Leys End. Instead follow the sunken lane by the hawthorn trees. As the row of trees end, look over to your left into the field above Leys End. In this field is a slight depression, and a trace of a path down to Leys End. The map in “Grane Revisited” shows the cross at the spot of the depression. There’s nothing to see of it now, of course, but there is a great view of Odgen and Holden Wood Resevoirs and the hills beyond. 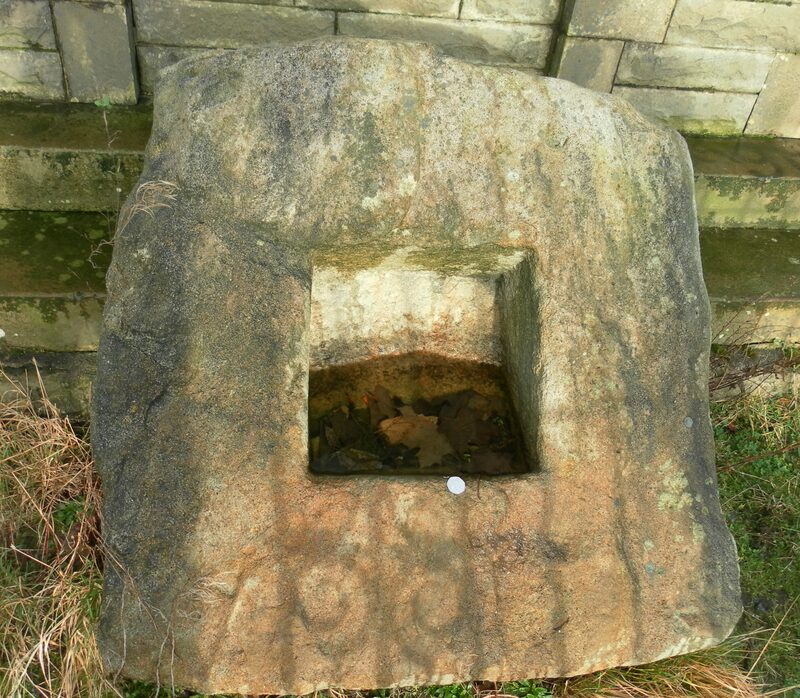 To view the original site of the cross, head over to Holden Hall Cemetery. There are car parks at either Holden Wood Antiques (the converted church building) or the Holden Arms pub. If you use their car parks then do pop in to either of them and give them some custom. 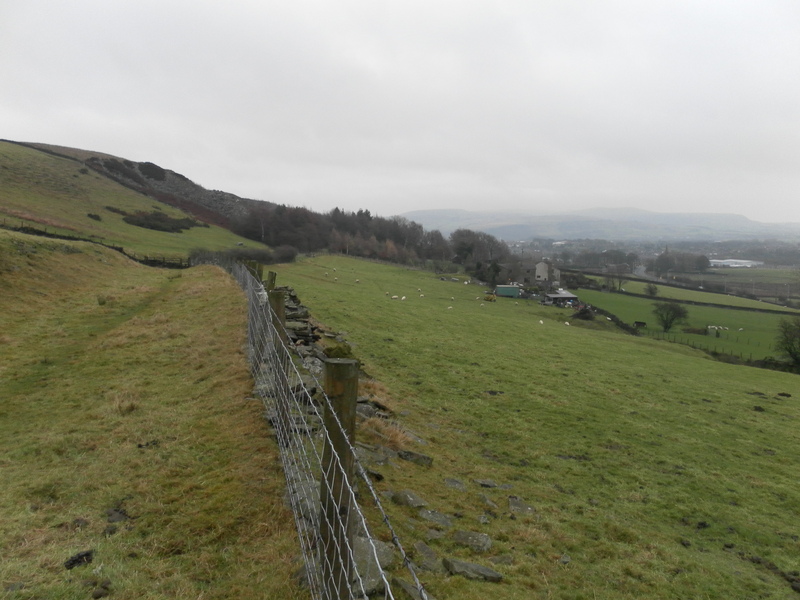 The cemetery is on the opposite side of the Grane Road. Follow the directions that we gave above for the walk westward towards Leys End. Grane Revisited: Four Walks Around Haslingden Grane (1991) Arthur Baldwin, David Dawson, David Openshaw and John Simpson, Rossendale Heritage Network. This is an excellent book, and is well worth tracking down (you can find it on Amazon).